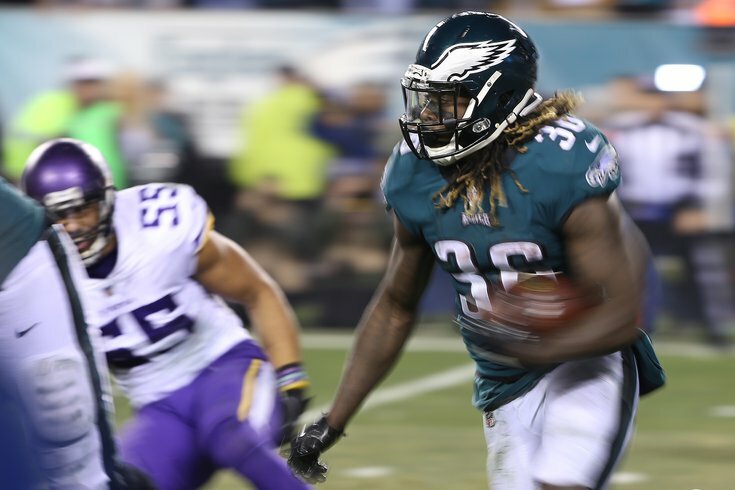 Philadelphia Eagles running back Jay Ajayi carries the ball in the fourth quarter of the NFC Championship Game. The last time the Eagles and the Vikings squared off, there was quite a bit on the line — a trip to Super Bowl LII, to be exact. On Sunday, they'll meet again at Lincoln Financial Field, and although a loss won't be season-ending for either team, it certainly feels that way. The Eagles need to win to stay above .500, while the Vikings are hoping to avoid their third-straight loss, a loss that would send them to a surprisingly poor 1-3-1 start. We've broken down the injuries, pointed out the key matchups to watch and offered our own predictions for this one. Now, as we do every Friday, it's time to take a look around the nation to see how the various experts, both local and national, think Sunday's matchup is going to play out. If the Eagles can protect Carson Wentz better than they did against the Titans (Minnesota missing Everson Griffen will help with that), and if they can somehow find a way to get a handle on Stefon Diggs and Adam Thielen, they'll prevail. I don't see those two things happening. Yes, they are a completely different team at home, but is the arbitrarily higher success rate of Philly at The Linc enough to base a pick solely on? • ESPN staff: Seven of their 10 national experts picked the Eagles to win. Last week, all 10 incorrectly picked the Birds to beat the Titans. The Eagles' defense is a totally different beast at home, holding opponents to an average of 14 points per game compared to nearly double that when away -- a trend that dates back to last season. Jim Schwartz's unit is itching to get back on track after a disappointing showing in OT against Tennessee. The offense, meanwhile, just welcomed back Alshon Jeffery, who stepped in last week and posted 100-plus receiving yards for the first time in an Eagles uniform. Doug Pederson and Mike Zimmer believe their team's early-season struggles won't doom them for the rest of the season, so let's consider Week 5 a turning point for both the Eagles and Vikings. With the running game reeling, generating a ground attack with a not-fully-healthy Dalvin Cook against the No. 1 rushing defense is a tall task. In order for Kirk Cousins to continue orchestrating a prolific passing attack, he needs his defense to carry its weight. The Vikings have lived with the nightmare of the NFC title game for far too long and had 10 days to prepare for the Eagles. An upset gets them back on track. The two combatants from the 2017 NFC title game aren't off to the kind of start everyone expected in 2018. The Vikings' once-vaunted defense has allowed Leif Erikson and everyone else to go from coast to coast. After Jared Goff torched the Vikes on "Thursday Night Football," they face the man who went one spot behind Goff in the 2016 NFL Draft. Key for Carson Wentz will be to get Alshon Jeffery going early. That might fall as much on Philly coach Doug Pederson as his quarterback. If Kirk Cousins heats up for Minnesota, look out -- the Eagles' secondary has been woeful thus far. I'm seeing Philadelphia rebound in front of the home crowd, but this NFC matchup could go either way. If the Vikings fall to 1-3-1, they had better hope the Packers drop to 2-2-1 in Detroit. Otherwise, Mike Zimmer's group will be in a sizable hole in the NFC North. • CBSSports.com staff: Four of their eight experts are picking the Eagles to beat the Vikings on Sunday, including Pete Prisco, who correctly picked an Eagles' loss in Week 4. • OddsShark: Their computer models, which have been incredibly accurate this season when it comes to the Eagles, once again nailed the prediction for last week's OT thriller in Nashville. Eagles fans should hope that trend continues, as they're picking the Birds to beat the Vikings by two touchdowns. The Vikings had extra time to get ready for an Eagles team that went deep into overtime. Neither team is what it was a year ago, but the Vikings should be able to exorcise their biggest demon from 2017. This is a big one, as the 2-2 Eagles and 1-2-1 Vikings both need to turn things around in a hurry. I like the defending champs. Quarterback Carson Wentz hasn't rediscovered his groove since returning from a major knee injury, and Philly's offense has lacked firepower all year. Maybe this is the week the Eagles turn it around, but the Vikings are even more due and may be even more desperate. • SBNation staff: Five of their seven experts are taking the Eagles over the Titans. • Philly.com staff: All four of their football writers are picking the Birds to win, including Les Bowen, who sees a 28-20 win for the Eagles. There can't really be a "must-win" game in Week 5 for a 2-2 team. But this kind of has that feel. If all that stuff that the Eagles kept telling us was fixable from the overtime loss Sunday in Tennessee really was so easily corrected, they will beat the Vikings and continue their home dominance (they've won 12 of their last 13 at Lincoln Financial Field, and the lone loss was that meaningless Week 17 game against Dallas last season). • Bleeding Green Nation staff: All seven of their writers are picking the Birds to improve to 3-2 this weekend. Despite the success Kirk Cousins has had against the Eagles’ defense through the years, this is a different team. And while this Eagles team is different than last season, they play pretty much the same way at home and have for two-plus seasons. Carson Wentz is still finding a groove, but he’s good enough to beat this Viking defense. The offensive line needs to show up, and I’d put money on the defense showing up. The Birds aren’t gonna let me down a third time, especially on my birthday. The Vikings have had time since Thursday’s loss to the Rams to rest and ponder their fate if they don’t win this game. They have to go to the East coast and try to keep the Eagles as off-balance as they were in coughing up a 13-point lead in their loss to the Titans last week. The Eagles’ offense has looked better most of the time the last two weeks with Carson Wentz (and, last week, Alshon Jeffery), and this would be a good week for it to take another step forward against a defense that’s looking shaky. The Eagles are slumping in the secondary and can’t run the ball like they want, but they still have Carson Wentz, Alshon Jeffery and Zach Ertz to rip through a reeling Vikings defense that will have trouble covering their particular skill sets. Kirk Cousins has great receivers too in Stefon Diggs and Adam Thielen, but those are the only things working for Minnesota. Philadelphia wins the 2017 NFC title game rematch thanks to the advantage on both lines of scrimmage.